MIDI control surfaces are commonly used in conjunction with audio plugins in digital audio workstation (DAW) environments. Synchronizing MIDI controls with plugin parameters provides a tangible interface for audio processing and is an efficient approach to parameter tuning. In the MATLAB® environment, audio plugins are defined as any valid class that derives from the audioPlugin base class or the audioPluginSource base class. For more information about how audio plugins are defined in the MATLAB environment, see Design an Audio Plugin. configureMIDI –– Configure MIDI connections between audio plugin and MIDI controller. getMIDIConnections –– Get MIDI connections of audio plugin. disconnectMIDI –– Disconnect MIDI controls from audio plugin. 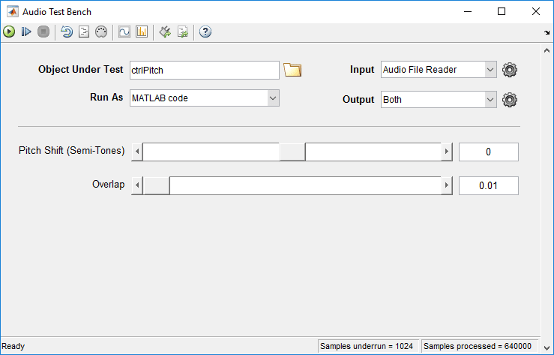 These functions combine the abilities of general MIDI functions into a streamlined and user-friendly interface suited to audio plugins in MATLAB. For a tutorial on the general functions and the MIDI protocol, see MIDI Control Surface Interface. This tutorial walks you through the MIDI functions for audio plugins in MATLAB. Before starting MATLAB, connect your MIDI control surface to your computer and turn it on. For connection instructions, see the instructions for your MIDI device. If you start MATLAB before connecting your device, MATLAB might not recognize your device when you connect it. To correct the problem, restart MATLAB with the device already connected. The Synchronize to MIDI controls dialog box opens with the tunable properties of your plugin automatically populated. When you operate a MIDI control, its identification is entered into the Operate MIDI control to synchronize box. After you synchronize tunable properties with MIDI controls, click OK to complete the configuration. If your MIDI control surface is bidirectional, it automatically shifts the position of the synchronized controls to the initial property values specified by your plugin. To open a MATLAB function with the programmatic equivalent of your actions in the UI, select the Generate MATLAB Code check box. Saving this function enables you to reuse your settings and quickly establish the configuration in future sessions. After you establish connections between plugin properties and MIDI controls, you can tune the properties in real time using your MIDI control surface. Audio Toolbox provides an all-in-one app for running and testing your audio plugin. The test bench mimics how a DAW interacts with plugins. Open the Audio Test Bench for your ctrlPitch object. When you adjust the controls on your MIDI surface, the corresponding plugin parameter sliders move. Click to run the plugin. Move the controls on your MIDI surface to hear the effect of tuning the plugin parameters. To establish MIDI connections and modify existing ones, click the Synchronize to MIDI Controls button to open a configureMIDI UI. To query the MIDI connections established with your audio plugin, use the getMIDIConnections function. getMIDIConnections returns a structure with fields corresponding to the tunable properties of your plugin. The corresponding values are nested structures containing information about the mapping between your plugin property and the specified MIDI control. As a best practice, release external devices such as MIDI control surfaces when you are done.